Cracking photo I try but fail, bit like the moon as well either too bright or to dark, I'll crack it in the end. In this case I braced the camera against a wall and set a slow film speed which forced a 4 second exposure. I've done this with fireworks in the past and it's always worked. That is a good one, SnowL. 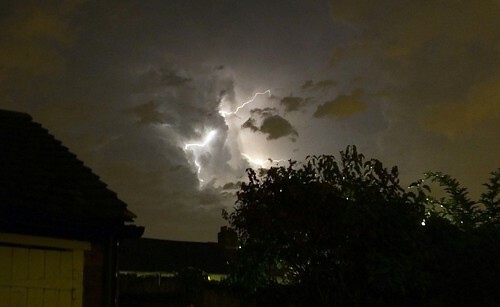 We had some good flashes in east London (our dog who really does not like thunder let us know about the storm about 2:45am) but all the light was in the clouds. I read that another way to do it is to set the camera to do bursts of photos... that increases the chance of getting one, too.